Assembly activity with the no. 2 Vega is highlighted in these images from the Spaceport’s ZLV launch site. At left, the solid propellant second-stage is raised for its installation atop Vega’s first stage, which is partially visible in the mobile gantry at the background. 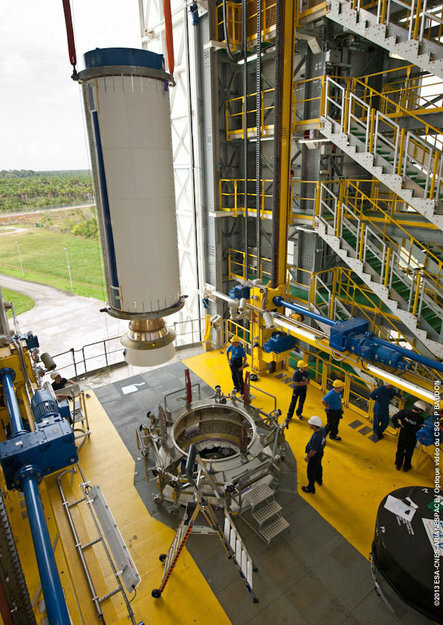 The Spaceport’s ZLV launch site in French Guiana is busy with activity as the second Vega undergoes its assembly for a mission scheduled in April. 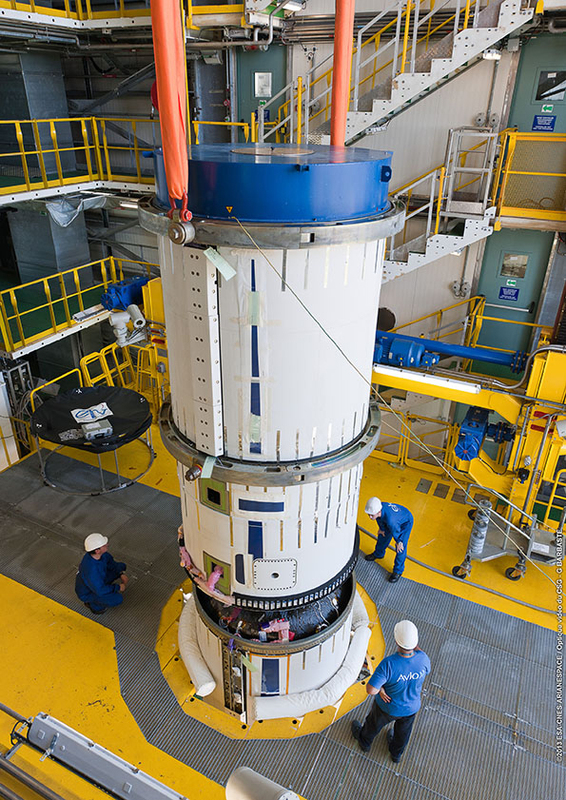 Build-up of the smallest member in Arianespace’s launcher family marked a new milestone this week when its solid propellant second-stage was integrated atop the first stage, which also uses solid propellant. 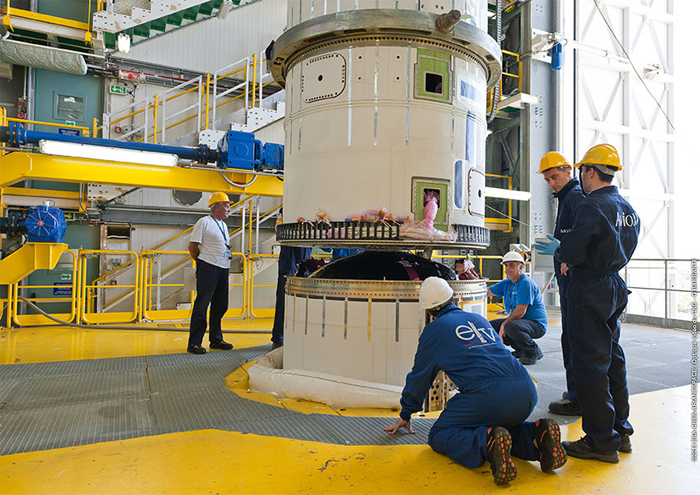 The vertical assembly process for Vega no. 2 is being performed on the ZLV launch pad, protected by a mobile gantry that will be withdrawn prior to the vehicle’s liftoff. 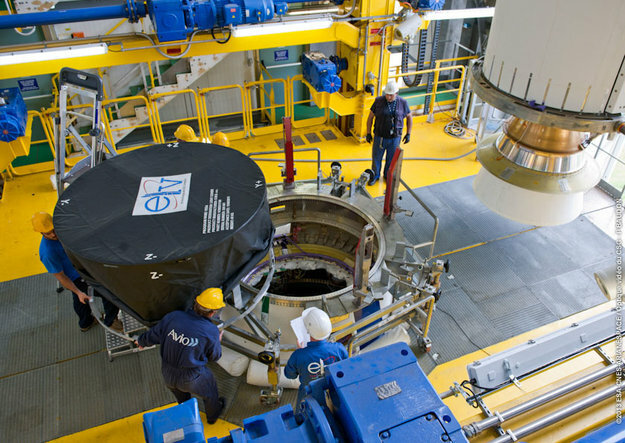 This complex uses the same site previously employed for missions from French Guiana with the cornerstone Ariane 1 and 3 vehicles – having been updated and adapted where needed to meet operational requirements of the new lightweight launcher. Vega’s upcoming second flight will orbit the Proba-V and VNREDSat-1A satellites, and follows the light-lift vehicle’s on-target maiden launch in February 2012 with a payload of nine spacecraft – which served as its qualification mission. The Proba-V passenger for Vega’s no. 2 launch was produced by prime contractor Qinetiq Space Belgium for the European Space Agency, and will monitor global vegetation growth. With an estimated mass of 160 kg., it is to operate in a Sun-synchronous polar orbit, carrying a newly-designed version of the Vegetation instrument already flown on the Spot series of Earth observation satellites – which also were orbited by Arianespace. Vega’s VNREDSat-1A co-passenger is an optical observation spacecraft built by Astrium on behalf of the Vietnam Academy of Science and Technology. With a mass of approximately 120 kg., it will support the Vietnamese government’s initiative to create an infrastructure that enables better monitoring and studies of climate change effects, improves predictions and actions to prevent natural disasters, while also optimizing the management of its natural resources. 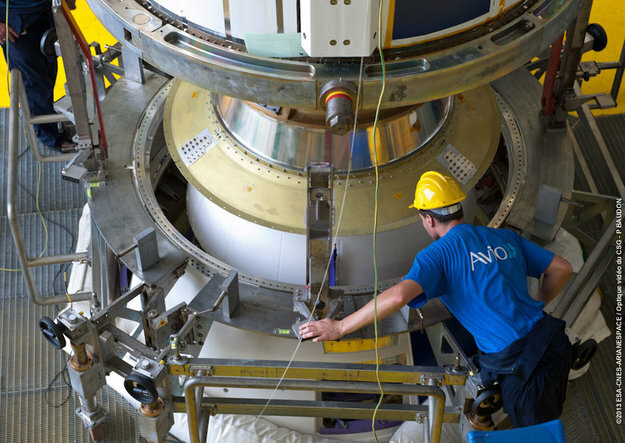 The four-stage Vega was conceived as a capable lightweight launcher, joining Arianespace’s medium-lift Soyuz and heavyweight Ariane 5 to provide a complete family of vehicles that meet the company’s motto of delivering “any payload, to any orbit…anytime.” Developed in a European program led by Italy’s ASI space agency and industrial prime contractor ELV SpA., Vega is tailored to orbit small- to medium-sized satellites, including institutional and scientific spacecraft. 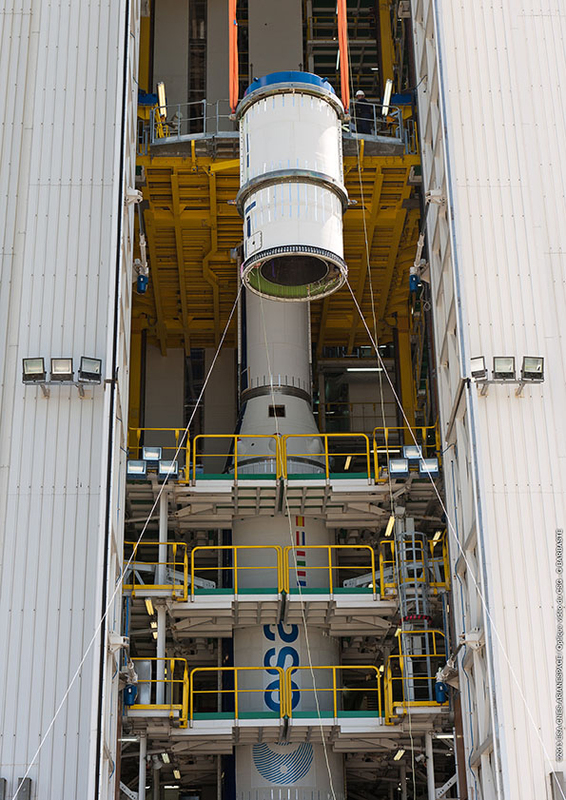 For Vega’s April mission, the launch is designated Flight VV02 in Arianespace’s numbering system, with the first “V” representing the French word for flight (“vol”), and the second letter referring to Vega. This will be the start of five flights scheduled in the European Space Agency’s VERTA (Vega Research and Technology Accompaniment) program, which aims to demonstrate the launch system’s flexibility as well as its ability to carry multiple satellite passengers. 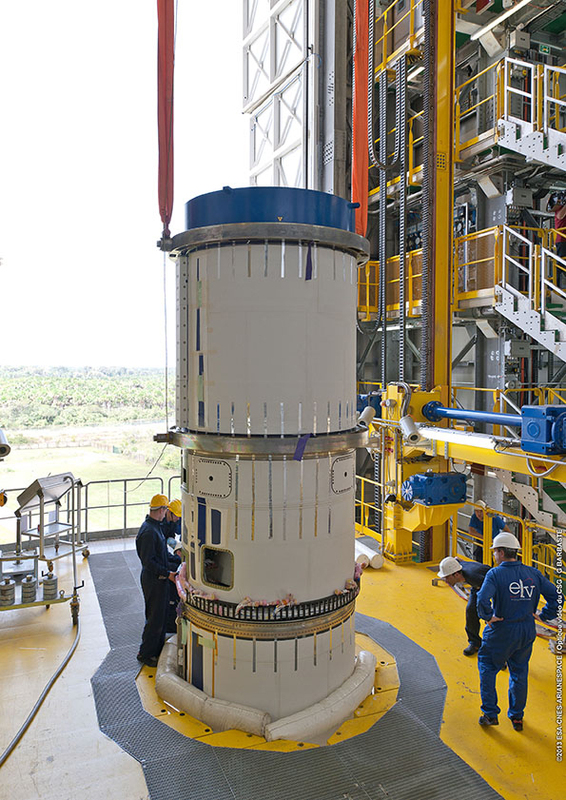 Vega’s Zefiro 9 stage is integrated on the launcher in these photos, beginning with its hoisting to the appropriate level of the ZLV launch site’s mobile gantry. In the photos at right, the Zefiro 9 is positioned atop the Vega’s two lower stages.